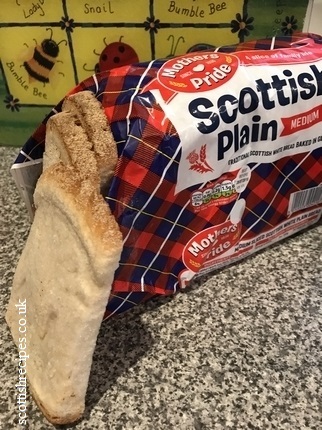 Scottish Plain Loaf has a characteristic dark and hard crust on the top and bottom of the loaf. There is no crust on the sides because they are baked in batches and then separated. For this reason, its other name is Batch Loaf. It is also known as Pan Bread or Plain Bread. It is taller than other traditional bread slices. An average slice is 15cm in height by 8cm in width. The crust ends are much thicker and gooier and are called the heels. They are also nicknamed the ootsider. Mothers Pride in Glasgow are the traditional bakers of Scottish Plain bread and they still wrap it in waxed packaging to keep it fresh. Their strap line is A slice of family life. Supermarkets that stock it in Scotland include Lidl. Each slice is approximately 115 calories and each loaf has about 16 slices.